This small project is a slave flash, which can trigger up to 4 camera flashes (non-TTL mode). It is meant for use with the Nikon CLS system, although it can probably work with other brands as well, as long as the protocol heuristics are similar. The heuristics of the Nikon CLS system are simple: there are a number of short pre-flashes, then a delay, then the main flash. The algorithm I am using basically waits until it sees a flash, reads in any number of flashes which occur with less than the designated time between them, and when another flash happens which is between the specified min and max times, it fires the slave flashes. The Digital Photography Tips and Technique blog wrote an article on Nikon CLS Advanced Wireless Lighting, as well as an implementation of a slave flash using the Arduino. 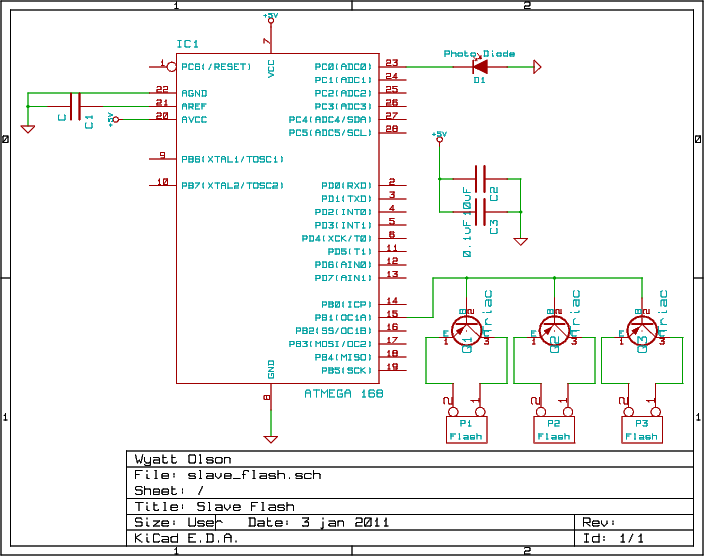 I used these resources heavily for understanding the protocol, although I chose to use a plain AVR instead of an Arduino for this project. I am using a Sharp BS520 for the photo diode, and a Philips BT131 series triac, although similar products could easily be used as well. The code is very simple. I use define statements for all threshold constants and port / pin definitions. I use my own libraries for the analog readings and the time counting; I plan to release these eventually, but they are not yet on my website; please feel free to email me with questions or if you would like me to send them to you. //The amount of delta required to register a flash. //The time after the last command pulse before the 'fire' command happens; in milli seconds. // ambient, as it is likely just than someone has turned the lights on. uint16_t ambient = 0; //Ambient light. Will be adjusted over time. //Pulse status 10 times to confirm flash. //Start of a new pulse after a delay of more than 40ms but less than 100ms; this is a fire pulse! //If the last pulse end time was too long ago, reset. //If the analog read value is sufficiently less than ambient, re-read ambient. // then we may need to adjust the ambient value. 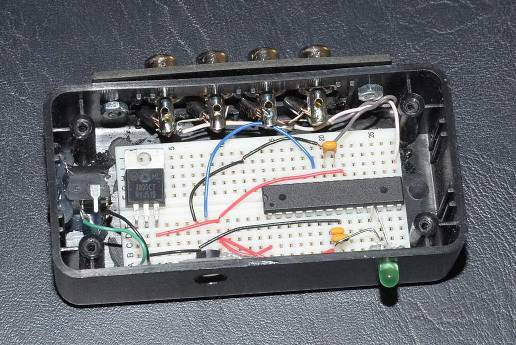 I put the entire thing into a small enclosure, on a breadboard (I love breadboards within enclosures -- it gives the professional look of a real enclosure, with the ability to change things that is inherent with breadboards!) There is a power plug and regulator in case I want to plug it into the wall; I also plan on including a small battery to power it eventually. The LED and photo diode on are on the front, while the flash connections are on the back (I use RCA connectors for this, along with modified flashes with RCA sync inputs).